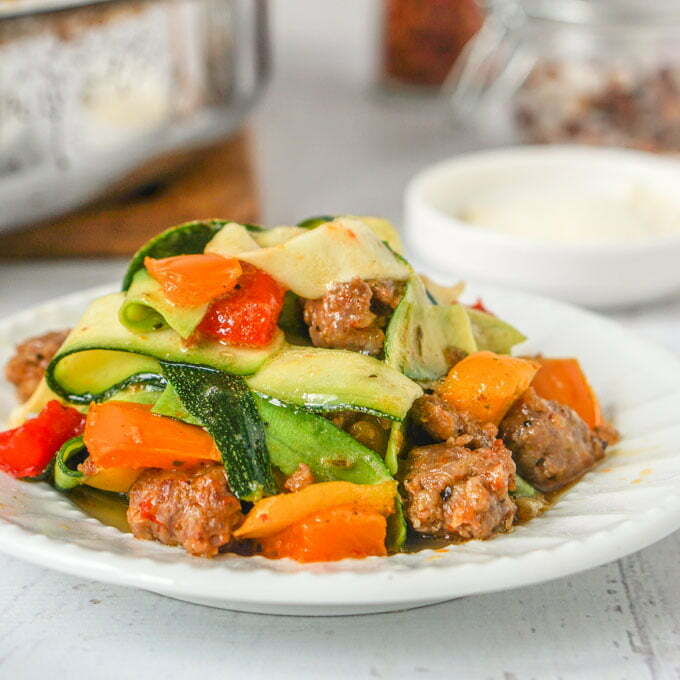 Wide Zucchini Noodles with Sausage & Peppers - low carb pasta! 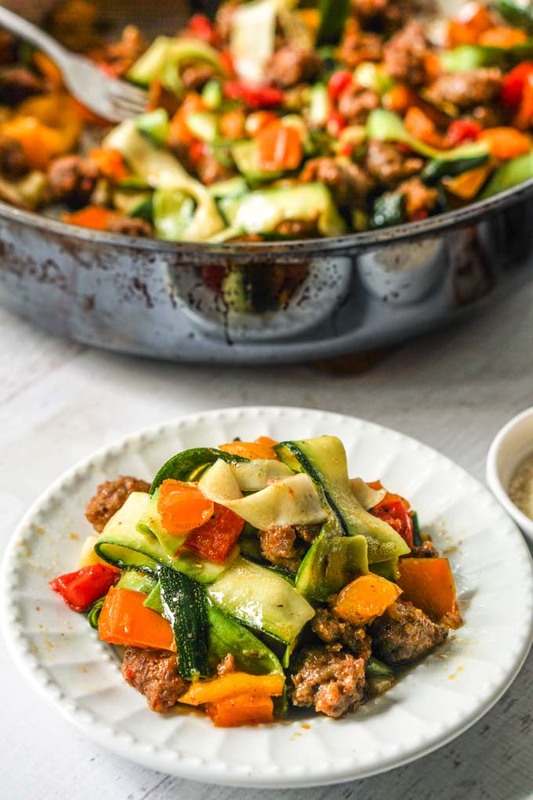 This meal of wide zucchini noodles with sausage & peppers is a delicious and easy low carb pasta dish for any day of the week. One serving has 196 cals and 6.4g net carbs. You might also like this low carb zucchini carbonara dish too! Today I wanted to post something that was not planned but it’s a dish I eat quite often because it’s easy and really tasty to me. 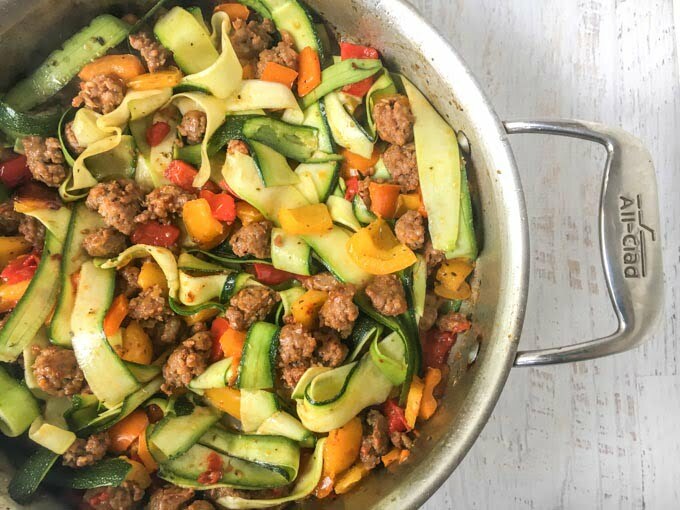 So the other day when I was craving pasta I made these wide zucchini noodles with sausage & peppers and it was sooo good and very, very easy. From start to finish it just took me less than 25 minutes! I think I have mentioned many times my love for vegetable noodles and I have many different ways of making them. Many use a spiralizer or hand held julienne peeler. However lately I have been LOVING these wide zucchini noodles using a regular ol’ potato peeler like this. There is something about the shape that makes I much more like pasta to me then the other shapes. Though honestly they are all good. However everyone has a ptoato peeler so give it a try! So to make these wide zucchini noodles find some medium sized zucchini and grab your potato peeler. Wash and keep the skin on as it adds contrast and give the noodles more texture. Start peeling the whole length of the zucchini for long wide noodles. I don’t use the core as it has tiny seeds and makes for mushy noodles. 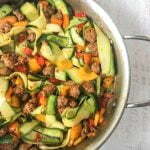 Above you can see I used zucchini noodles, 3 colored bell peppers, olive oil, garlic and sweet Italian sausage. That’s all and boy was it loaded with flavor! You start by adding the olive oil and sausage to a large skillet. Once the sausage is browning, add in the peppers and saute until they are tender. Then add in your garlic and continue to cook for a minute or two. Then take it off the stove and mix in your zucchini noodles. I didn’t even pre cook them because the heat from the sausage mixture will make them wilt and I like them to have a little bite to them. That’s all folks. You can even sprinkle some grated cheese on top if you like. Note that I don’t precook the zucchini noodles because I like them to be al dente. If you wish to have softer noodles, just cook them in the microwave for 30 second intervals until done to your liking. Don’t cook them too much or they will be too mushy. Just a minute or two. In a large saute pan, add 1 tablespoon of oil and heat up pan. Add the Italian sausage and cook for a few minutes. Once the sausage starts to brown, add in the peppers, salt and Italian seasonings. Once the peppers start to soften add in the garlic and cook for a few more minutes. 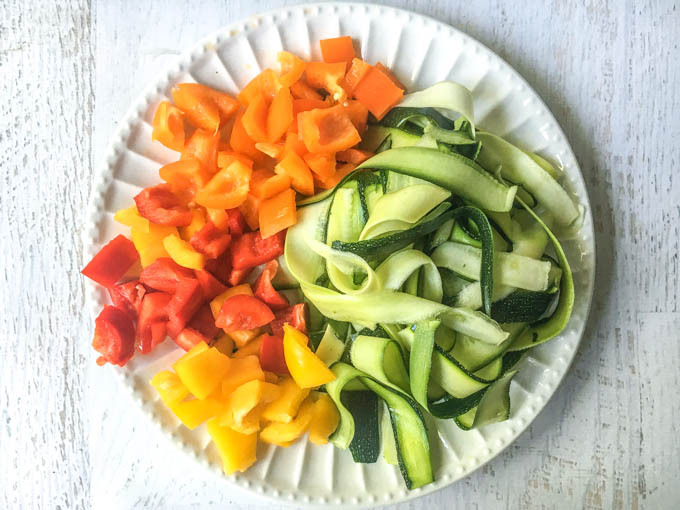 Meanwhile using a potato peeler, make your wide zucchini noodles. 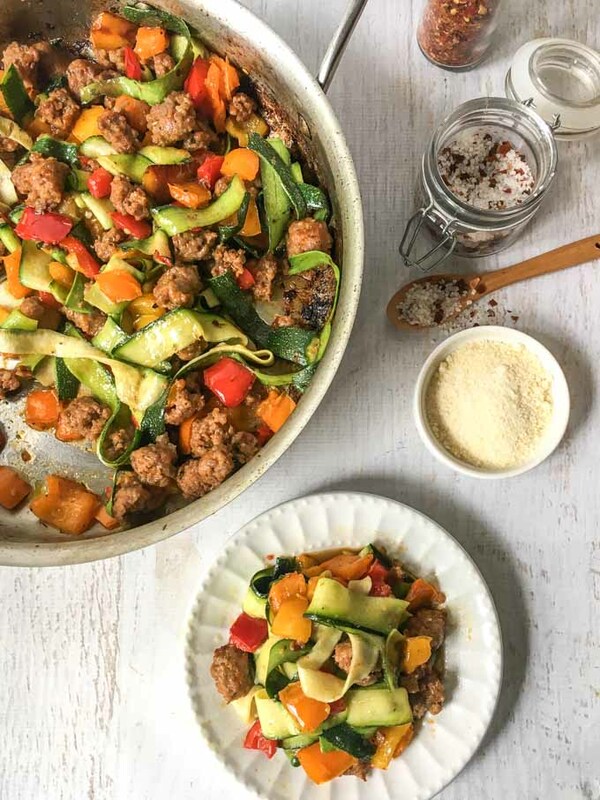 When sausage mixture is done, add in the zucchini noodles and mix to combine. I don't pre cook the zucchini because they will wilt with the hot sausage mixture and I like them al dente. However if you wish to have softer noodles, place them in microwave for 30 second intervals until done to your liking. Just a minute or two. Then add to the pepper mixture and mix well to combine. 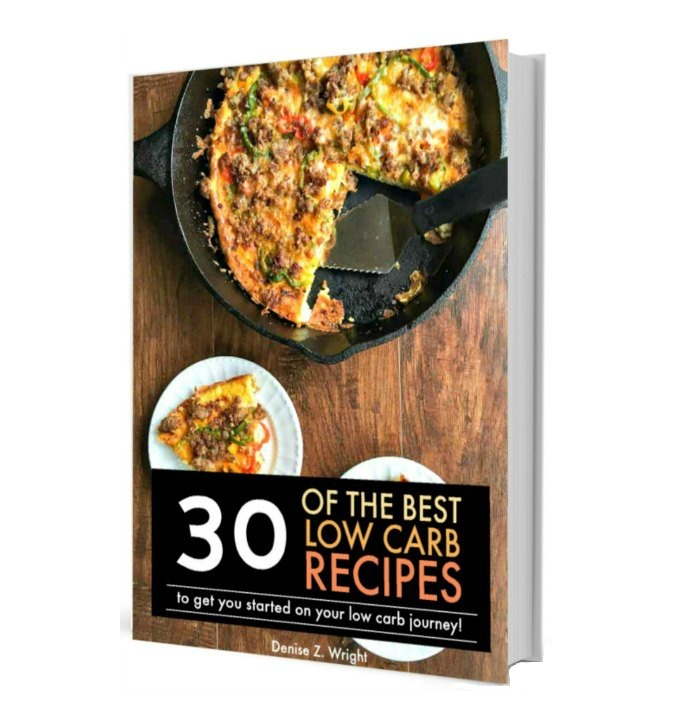 Previous Post: « Low Carb Cheesy Cauliflower Casserole- an easy, cheesy keto side dish! So delicious! Love all the colors, such a good looking meal!